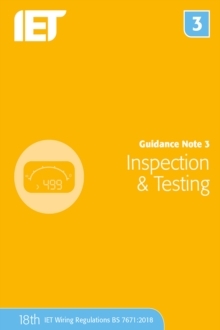 Guidance Note 3: Inspection & Testing is a fundamental guidance book for all those involved with the testing and inspection of electrical installations. It also contains essential guidance for those studying for inspection and testing qualifications and has been fully updated to BS 7671:2018. The 18th Edition IET Wiring Regulations publishes in July 2018 and comes into effect on 1st January 2019.